The term LVDT or Linear Variable Differential Transformer is a robust, complete linear arrangement transducer and naturally frictionless. They have an endless life cycle when it is used properly. Because AC controlled LVDT does not include any kind of electronics, they intended to work at very low temperatures otherwise up to 650 °C (1200 °F) in insensitive environments. The applications of LVDTs mainly include automation, power turbines, aircraft, hydraulics, nuclear reactors, satellites, and many more. These types of transducers contain low physical phenomena and outstanding repetition. The LVDT alters a linear dislocation from a mechanical position into a relative electrical signal including phase and amplitude of the information of direction and distance. The operation of LVDT does not need an electrical bond between the touching parts and coil, but as an alternative depends on the electromagnetic coupling. What is an LVDT (Linear Variable Differential Transformer)? The LVDT full form is “Linear Variable Differential Transformer” is LVDT. Generally, LVDT is a normal type of transducer. The main function of this is to convert the rectangular movement of an object to the equivalent electrical signal. LVDT is used to calculate displacement and works on the transformer principle. The above LVDT sensor diagram comprises a core as well as a coil assembly. Here, the core is protected by the thing whose location is being calculated, while the coil assembly is increased to a stationary structure. The coil assembly includes three wire wound coils on the hollow shape. The inside coil is the major, which is energized by an AC source. The magnetic flux generated by the main is attached to the two minor coils, making an AC voltage in every coil. The main benefit of this transducer when we compared with other LVDT types is toughness. As there is no material contact across the sensing component. Because the machine depends on the combination of magnetic flux, this transducer can have an unlimited resolution. So the minimum fraction of progress can be noticed by an appropriate signal conditioning tool, and the transducer’s resolution is exclusively determined by the declaration of the DAS (data acquisition system). LVDT comprises of a cylindrical former, which is bounded by one main winding in the hub of the former and the two minor LVDT windings are wound on the surfaces. The amount of twists in both the minor windings is equivalent, but they are reverse to each other like clockwise direction and anti-clockwise direction. For this reason, the o/p voltages will be the variation in voltages among the two minor coils. These two coils are denoted with S1 & S2. 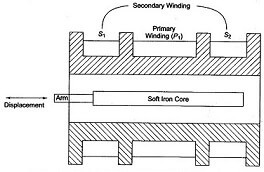 Esteem iron core is located in the middle of the cylindrical former. The excitation voltage of AC is 5-12V and the operating frequency is given by 50 to 400 HZ. The working principle of the linear variable differential transformer or LVDT working theory is mutual induction. The dislocation is a nonelectrical energy that is changed into an electrical energy. And, how the energy is altered is discussed in detail in the working of an LVDT. The working of LVDT circuit diagram can be divided into three cases based on the position of the iron core in the insulated former. In Case-1: When the core of the LVDT is at the null location, then both the minor windings flux will equal, so the induced e.m.f is similar in the windings. So for no dislocation, the output value (eout) is zero because both the e1 & e2 are equivalent. Thus, it illustrates that no dislocation took place. In Case-2: When the core of the LVDT is shifted to up to the null point. In this case, the flux involving with minor winding S1 is additional as contrasted to flux connecting with the S 2 winding. Due to this reason, e1 will be added as that of e2. Due to this eout (output voltage) is positive. In Case-3: When the core of the LVDT is shifted down to the null point, In this case, the amount of e2 will be added as that of e1. Due to this eout output voltage will be negative plus it illustrates the o/p to down on the location point. The different types of LVDTs include the following. These types of LVDTs are superior for lengthy working series. This LVDTs help to prevent incorrect arrangement because they are directed and controlled by low resistance assemblies. These types of LVDTs have unlimited resolution behavior, the mechanism of this type of LVDT is a no-wear plan that doesn’t control the motion of calculated data. This LVDT is connected to the sample to be calculated, fitting limply in the cylinder, involving the linear transducer’s body to be held independently. Utilize internal spring mechanisms, electric motors to move forward the armature constantly to its fullest level achievable. These armatures are employed in LVDT’s for sluggish moving applications. These devices don’t need any connection between the armature and specimen. The highest difference from straight proportion among distance calculated and o/p distance over calculating range. > -32ºF, (-32-32ºF), (32 -175ºF), (175-257ºF), 257ºF & up. The range of temperature within which the device must accurately operate. Explains the percentage of the difference between the genuine value of the amount of data. A serial protocol like RS232, or Parallel protocol like IEEE488. Frequency Based, Current Balance AC/AC based, or DC/DC based. The LVDT advantages and disadvantages include the following. The measurement of the displacement range of LVDT is very high, and it ranges from 1.25 mm -250 mm. The LVDT output is very high, and it doesn’t require any extension. It owns a high compassion which is normally about 40V/mm. When the core travels within a hollow former consequently there is no failure of displacement input while frictional loss so it makes an LVDT as a very precise device. The power consumption of the LVDT is very low which is about 1W as evaluated by another type of transducers. LVDT changes the linear dislocation into an electrical voltage which is simple to progress. LVDT is responsive to move away from magnetic fields, thus it constantly needs a system to keep them from drift magnetic fields. It is accomplished that LVDTs are more beneficial as contrasted than any kind of inductive transducer. LVDT gets damaged by temperature as well as vibrations. The applications of the LVDT transducer mainly include where dislocations to be calculated that are ranging from a division of mm to only some cms. The LVDT sensor works as the main transducer, and that changes dislocation to electrical signal straight. This transducer can also work as a secondary transducer. LVDT’s are mostly used in industries as well as servomechanisms. From the above information finally, we can conclude that LVDT characteristics have certain significant features and benefits, most of which derive from fundamental physical principles of operation or from materials and techniques used in their construction. Here is a question for you, what is the normal LVDT sensitivity range?